In this Nov. 9, 2017, file photo, U.S. President Donald Trump China's President Xi Jinping arrive for the state dinner with the first ladies at the Great Hall of the People in Beijing, China. Trump is closing in on a decision to impose punishing tariffs on tens of billions of dollars of Chinese goods as early as June 15, a move that could put his trade policies on a collision course with his push to rid the Korean Peninsula of nuclear weapons. Trump has long vowed to fulfill his campaign pledge to clamp down on what he considers unfair Chinese trading practices. But his calls for about $50 billion in tariffs could complicate his efforts to maintain China's support in his negotiations with North Korea. 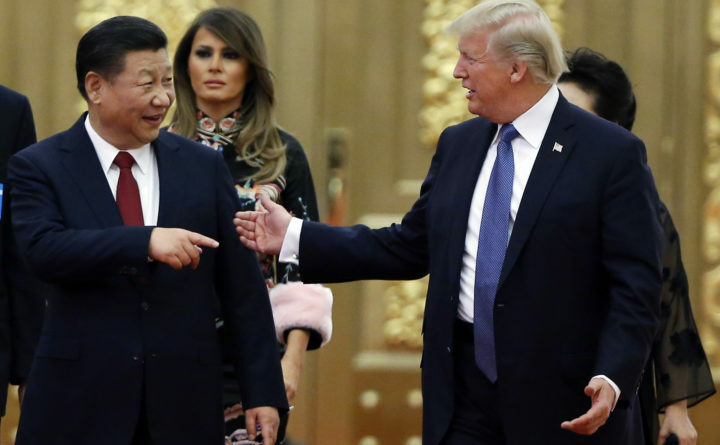 WASHINGTON – President Donald Trump on Friday will announce tariffs on $50 billion of Chinese products, the latest move in his intensifying campaign to rewrite the rules of global trade. The action will come one day after Secretary of State Mike Pompeo visited Beijing for talks with Chinese leaders about the president’s recent meeting with North Korean leader Kim Jong Un. The tariffs, which Trump set in motion in March, are a response to China’s practice of compulsory technology licensing for foreign companies and its efforts to steal U.S. trade secrets via cybertheft, administration officials have said. The president has blamed China for the loss of 60,000 U.S. factories and 6 million American jobs, numbers most economists regard as including the effects of increased manufacturing automation. He has identified reducing the $375 billion annual trade deficit with China as a key test of his “America First” trade strategy. Although the import levies affect less than 10 percent of the $505 billion in Chinese goods that Americans buy each year, Trump’s new trade barriers mark a historic change after three decades of deepening ties between the world’s two largest economies. The administration initially said that up to 1,300 products could be hit with the tariffs, which American importers pay and pass on to their customers. Some new products will replace some original items on the list to be announced Friday. As a result, not all of the tariffs will go into effect at the same time, allowing for public comment on the new goods. Robert Lighthizer, the president’s chief trade negotiator, has said that the tariff list would be designed to minimize the impact upon consumers. Trump has resorted to tariffs with an enthusiasm not seen in an American president in at least 80 years. His import taxes on steel and aluminum have drawn protests from companies that use foreign-made metals, farmers who fear U.S. trading partners will retaliate against them and Republicans in Congress.